Anyone still out there? I've have zero good excuses for why I haven't been blogging. Are blogs still cool? Seems like it's all about Instagram and Facebook these days, and I follow a lot of funny people on Twitter but haven't had the guts to post on it myself yet. I know you were all dying to know my thoughts on social media so you're welcome! Let us move on to more important matters, and that is Kohl's. Good ol' Kohl's; always good for a laugh. I usually find nothing there but the occasional surprisingly cute shoes. Well I was pleasantly surprised again the other day when I found a really cute shower curtain for my daughter's bathroom! 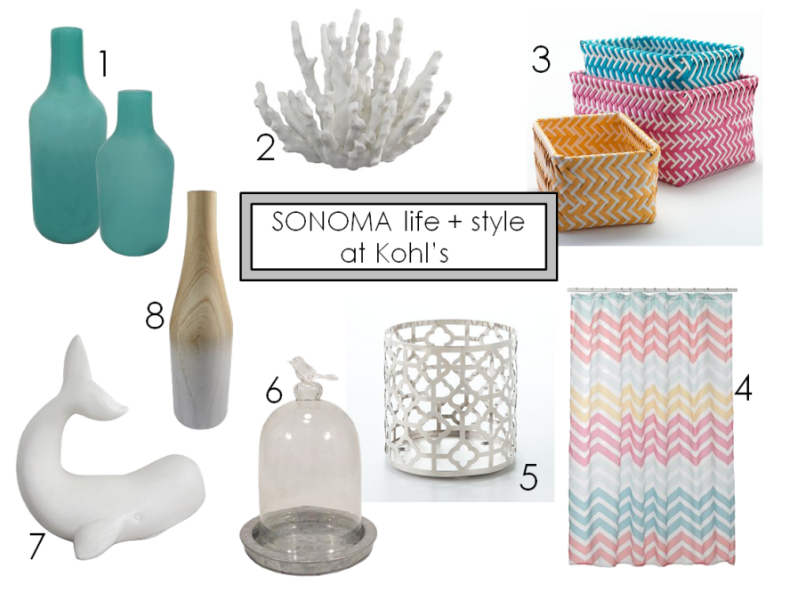 It was from the brand Sonoma Life + Style, and when I got online I found several other cute home decor items from the same line. I love that curtain and the baskets. I never go to Kohls but I may have to now. Glad to see you blogging again! Love the curtain as well! Sometimes I walk into Khols and I'm surprised too! I usually only go when i get their $10 off coupons in the mail. Hey there! I have you on my google reader. So glad you popped up! Kohls is like Ross, hit-n-miss for some houseware treasures. Cute shower curtain and I love the whale accessory. I just happened to check today, I must have felt your blog vibes. Finally the shower curtain will be purchased! Very cute stuff, Ivy will love it. I think I'm going to go to Kohl's and get that glass bird cloche. This is so perfect for my dining table decoration, and a pair of geometric candle holder is a must!